1.The clippers can be used on thick or thin hair. When use on thick hair, normally it takes longer time than the thin hair. 2.It's very important to keep the hair clean before running the clipper. Make sure no matts, no dirt on the hair. If pets hair get knotted, please cut with scissor or groom the hair with the comb included, or the hair will get clogged in the clipper or the attachment comb, increasing grooming difficulty. BEST PET GROOMING CLIPPERS FOR MOST SELF-GROOMERS! This Pet Clipper is Definitely Your Best Buy on Amazon! Lithium Battery-Charge 90 minutes and use 2 hours. Just search on Amazon, lithium battery pet clippers all at the price above $45. We always dedicate our effort to reduce the cost and offer best cost performance product to all customers. Have a try and you will love it ! 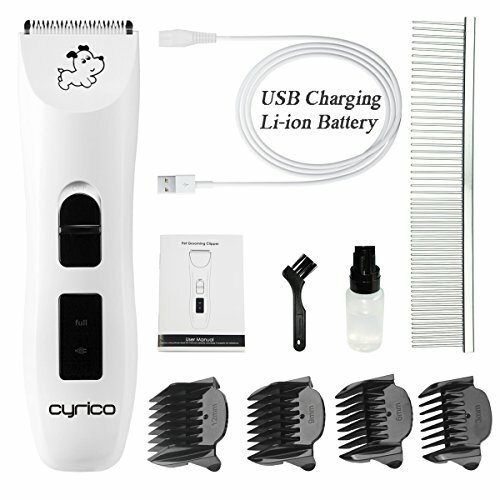 The pet grooming clipper uses a universally USB cord charging.The pet hair clipper can be charged by putting the USB plug into any your mobile adapter. The clippers can be charged over the world, as long as you have your mobile adapter. We offer FULL REFUND OR FREE REPLACEMENT for Our Customers if you are not satisfied with our product. Contact us via lhmarita@outlook.com for any after-service help.NO RISK PURCHASE AT ALL! [Best Price Lithium Pet Clippers on Amazon:-90mins Quick Charging for 120mins Use] The battery inside the rechargeable pet clipper is high quality 1000mA lithium battery to ensure quick charging and long time using. Currently other li-ion pet clipper costs at least $45.Other dog clippers at price under$30 always need charging 5 hours and just use 60 minutes. Welcome to compare us with others and you will make the smartest decision. [UNIQUE USB CHARGE Pet Hair Clipper] Cordless usb charge pet clipper. This pet grooming clippers is designed cordless using to be more user-friendly use. The pet hair clipper can be charged by putting the USB plug into any your mobile adapter. No matter you are using Android phones or Iphone, the clipper USB plug can match it. The clipper can be also used when you are charging. [Extremely Quiet and Powerful Motor]. The updated motor inside of the dog clippers works with very low noise. You can nearly hear no sound when clipping the animals It produces very low noise when it is working. Meanwhile, the Germany imported motor will not disappoint you on its power. It will cut the pet hair just as butter. [Unique Blade to Protect Pets from Injury] The blade of the pet trimmer is extremely sharp for pet hair cutting. The ceramic and stainless steel blade are combined so that it generates less heat than most double stainless steel blade. You don't need to worry that your dogs get hurt when clipping. Please notice that it is normal for the blade to get hot when working for a period of time. It's better to get rest after working for 15 minutes. [100% Money Back Guarantee] We have full confidence with the pet grooming kit and will back up with full support. We offer 100% money back guarantee or free replacement with no question ask. Welcome to contact us via lhmarita@outlook.com. YOU TAKE NO RISK TO PURCHASE AT ALL. If you have any questions about this product by cyrico, contact us by completing and submitting the form below. If you are looking for a specif part number, please include it with your message.